While you might be impressed with the low price that you find when you shop for the cheapest new vehicle on the market, what you don’t see is the features that you’re missing. Even though the 2019 Toyota Yaris is the most affordable model from this brand, you’ll be able to enjoy the fact that you can have a great drive and some amazing features that will give you the drive you’re after. As a new subcompact sedan that you can enjoy on the road, the Yaris has become a wonderful choice for your daily commute. Do you remember the dynamic and fun to enjoy Mazda2? If so, you’ll love what the Yaris has to offer. This car is built on the same platform that was used for the Mazda2 and it has some of the characteristics that can make a huge difference for you to have the ride you want. When you’re looking for a new car that’s inexpensive but easy to drive, the Yaris is the one that you’ll want to choose for the ride you’ve been after during the daily commute that you have to drive. 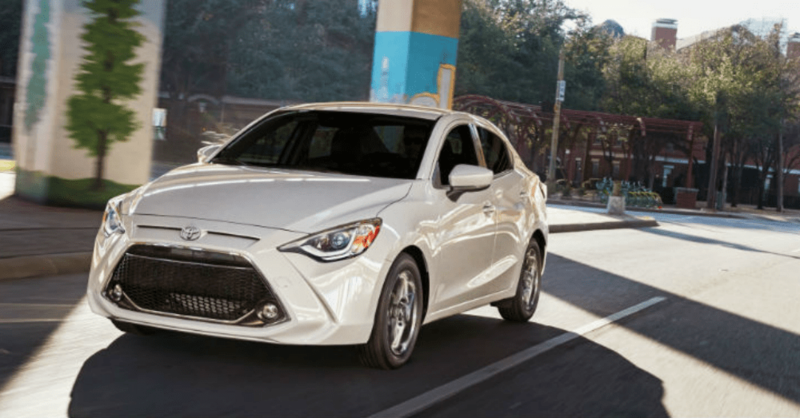 For the 2019 model year, the Toyota Yaris has dropped the iA from the name to be a subcompact sedan that’s an excellent model to enjoy. This car receives an updated grill design, three trims for you to choose from, and plenty of features that will give you the experience you’re looking for. This is a car that’s great for driving every day, can be the right first car for a new professional, or it could be the right last car for someone that wants to enjoy an easy drive on the road. Which Trim is the One You Want? The 2019 Toyota Yaris is offered in three trims. The base model is the L trim which gives you power windows and locks, a six-way adjustable driver’s seat, a tilt/telescoping steering wheel, push-button starting, a seven-inch infotainment screen, HD Radio, two USB ports, Bluetooth connectivity, six airbags, the low-speed pre-collision offered by Toyota and an excellent driving personality. This little car can be a lot of fun when you take it for a great drive and let it be the right one for you to enjoy every day. If you want to enjoy an automatic transmission on the L or LE models, it’s an option. The LE model does give you the benefits of keyless entry, 16-inch wheels, fog lights, heated outside mirrors, and a rear spoiler. The XLE is the top trim and this model gives you leatherette upholstery, a leather-covered steering wheel, automatic LED headlights, rain-sensing wipers, and automatic climate controls. Every model can give you the ability to upgrade the infotainment system to add a navigation feature to help you get where you need to go. When you’re looking for a subcompact car that can give you the features you want and a great drive, the 2019 Toyota Yaris is right for you. This car uses a 1.5-liter four-cylinder engine that makes 106 horsepower and 103 lb.-ft. of torque for the drive. This engine can be attached to either a six-speed manual or six-speed automatic transmission for the drive. The manual models give you 30 city/39 hwy mpg while the automatic versions of this car can return 32 city/40 hwy mpg to make sure you have the driving experience you’re looking for. The Toyota Yaris is a car that you might normally overlook, but it’s one that truly does give you an amazing ride. This car is packaged the right way for you to experience the drive you’re after on the road. Visit your nearby Toyota dealership and take a look at the 2019 Toyota Yaris and see which trim level will be the one that you choose to drive. This car has matured to be one that can be right for you to have an excellent ride on the roads during your daily commute.